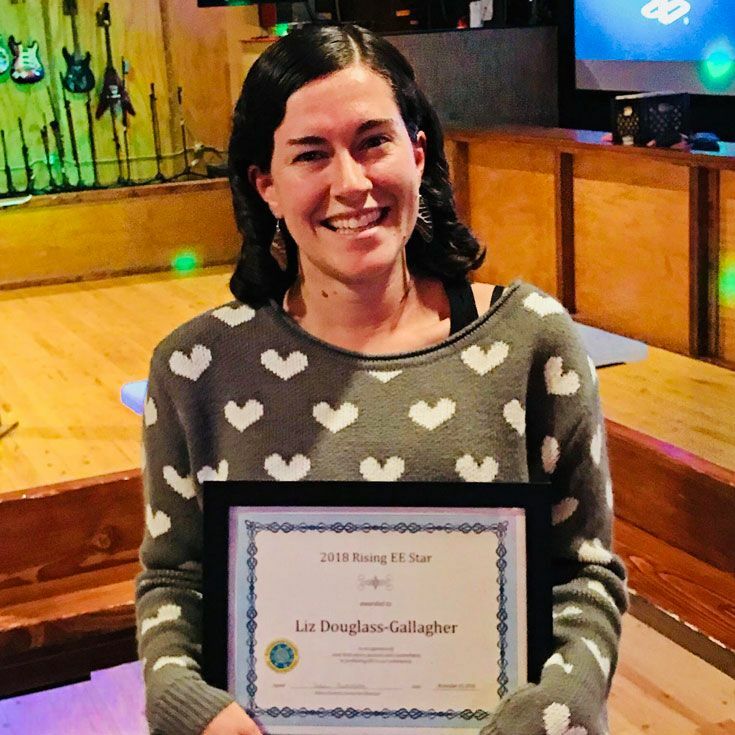 On November 10, Liz Douglass-Gallagher, BEMP staff member and Bosque School 6th grade science teacher, was awarded the 2018 Rising EE Star by EEANM (Environmental Education Association of New Mexico). The award recognizes environmental educators who have been in the field for 10 years or less who demonstrate, among other traits: passion and commitment for environmental education along with integrity and a strong work ethic, innovation in environmental education activities and programs, a desire to seek opportunities for partnerships and collaborations, and equity and inclusion when developing activities and programs. Liz was nominated by a co-worker and had that nomination supported with many letters of support written on her behalf. One Rising EE Star is awarded each year by EEANM. But after completing her master’s studies in 2017, she moved back to Albuquerque and sought a position that would allow her to bridge her experience in the natural and social sciences. That’s when she discovered the opening with BEMP. “I was really drawn to the organization, teaching science literacy and about the environment and how to care for ecosystem,” she said. It’s a position she’s flourished in and has now increased her capacity with her recently-acquired role as a 6th grade science teacher. She credits the support of the Bosque community for the opportunity. “It’s a really perfect environment for me to grow and explore in those ways,” she said. Congratulations, Liz! Thank you for your passion for environmental education and your amazing ability to bring students, educators, and partners together! The vision of EEANM is “a culturally and geographically diverse New Mexico citizenry with the knowledge, skill, attitude, and commitment, to make informed decisions about their environment. To learn more about the organization, visit www.eeanm.org.